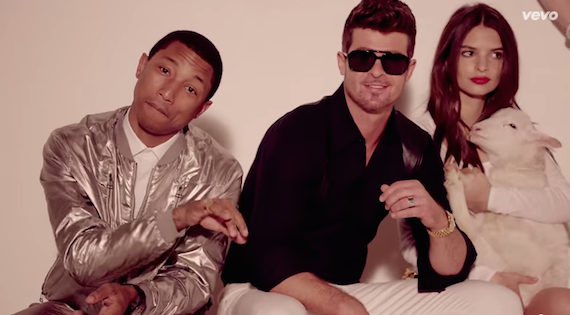 Williams and Thicke in the “Blurred Lines” music video. Attorneys on both sides of the “Blurred Lines” lawsuit are questioning the verdict handed down by the jury. According to the New York Times, Busch has now filed with the court to “correct the jury’s verdict,” seeking that the song’s third writer, rapper T.I. (real name Clifford Harris Jr.), and the record labels Star Trak (Williams’s label) and Interscope also be found liable. The previous verdict held only Thicke and Williams liable. The Gayes are also seeking an injunction to prevent further distribution of “Blurred Lines,” until legal proceedings are finalized. Attorney Howard E. King, who represents Thicke’s side, is asking the court for more time to file a motion for declarative relief, “due to the inconsistent jury verdict and complexity of issues arising therefrom,” reports the NYT. Read MusicRow’s exclusive interview with Busch.